John Allcock proposed to Liz at Whitestone pond. He pulled up the E-type Jaguar and sat Liz on a bench near the pond. After she said yes he produced champagne and glasses. Pauline later admitted to Liz that she and some friends "go out once a month but before we go anywhere we go and have a drink. We meet at Whitestone Pond on your spot because one day a man will come up with an E-type Jaguar and ask me to marry him." 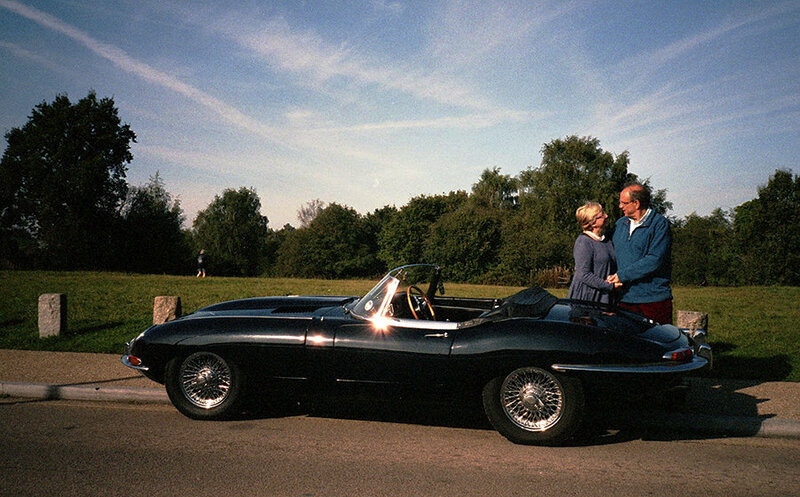 I photographed Liz and John Allcock by Whitestone Pond, with that original E-type Jaguar. In the background, just past Liz, is the bench dedicated to Pauline.